How do I Uninstall v1.8? I did not know how to make the switch of Server to Client, as Computer 1 (which incidentally has a new disc and OS so no history of Synergy) is not showing at all. First screen shows my husband's machine in the next room (which should not be showing at all) as Client but greyed out, and when I attempt to reconfigure the screens it asks me to add this unwanted machine. Since Support has been too busy to help (it's not urgent but it's been several days and I'd like to get it working now) I eventually tried changing screen names so have now lost the original names. I would like to uninstall it. There were instructions for uninstalling Synergy 2 in that forum and I used them previously with success, but I don't remember if/where there are instructions for uninstalling V1. It'd help if we knew what kind of machines we were dealing with (Windows? Linux? Mac?) as the deinstallation instructions differ for each platform. In general, though, you'd use the same sort of procedure you used for installation, as there's usually an option for removal. when I used ver 1, I developed the habit of a 'clean' install. I made sure to purge every Synergy file. I'm lazy, I use a free version of Revo Uninstall. It's a little more trouble but I still do it that way even with the new releases of Synergy 2. It'd help if we knew what kind of machines we were dealing with (Windows? Linux? Mac?) as the deinstallation instructions differ for each platform. Sorry, I'm on MacOS 10.12.6. The installation process I used was, from memory, the usual Mac one of simply clicking on a .dmg packagre, so unknown files can be distributed in whatever part of the directory they need to be. The deinstallation instructions I followed for Version 2 were a set of terminal instructions, posted by Nick Bolton at the head of the Version 2 Self Help forum. I'd never used Terminal before but they were very clear and it worked smoothly. I assume it removed all files. I have wondered about deinstallation programmes but hadn't read much about them. The audio/music production software I use can often get hung up on leftover files from previous versions or unused or trial software, so I do try to remove all files. 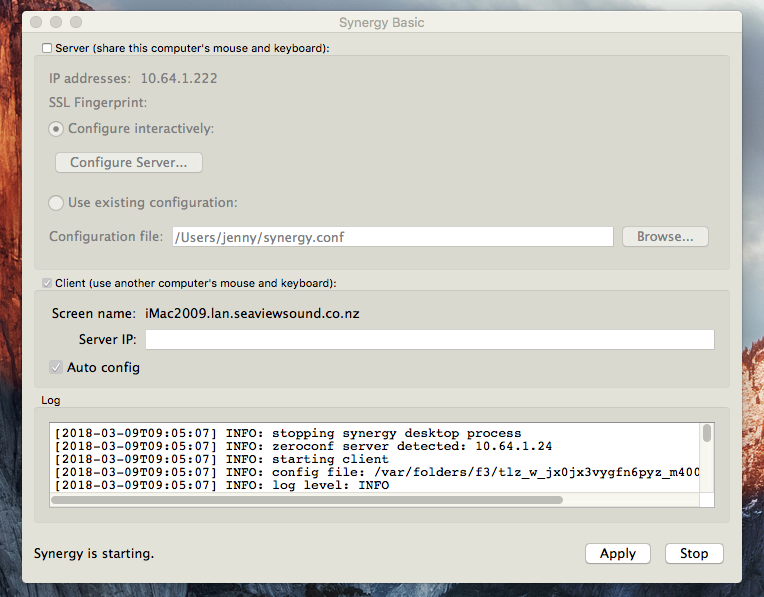 Actually, I haven't yet tried deleting the .plist file for Synergy 1.8...that might fix my configuration issue. I will look for one in Library folder. User or Shared Library, I wonder? Wow! That was fast! What do you think about deleting the preferences? I've used Revo Uninstaller for years for all sorts of uninstalls. I think I've only used it on Windows. Sadly, I don't have a MAC. Thanks GranPa. I'll try the .plist deletion. haha, not much danger of that, I don't know what Unix [EDIT: that should be UNIX not Unix? see what I mean?] means My husband is a programmer otherwise I wouldn't have a computer at all most likely. He is not keen on getting involved in the problems I create by being an adventurous user, but he takes care of all the big stuff and hardware, so I am unusually ignorant of some basics, while crammed with info about some niche audio areas. Update- I found the .plist file in (Shared I think) Library/Preferences on theiMac (old client, new Server), trashed it, and started Synergy. It recognised the computer immediately, with no sign of the unwanted machine. The configuration was ok and the log looked like it was ready to run. 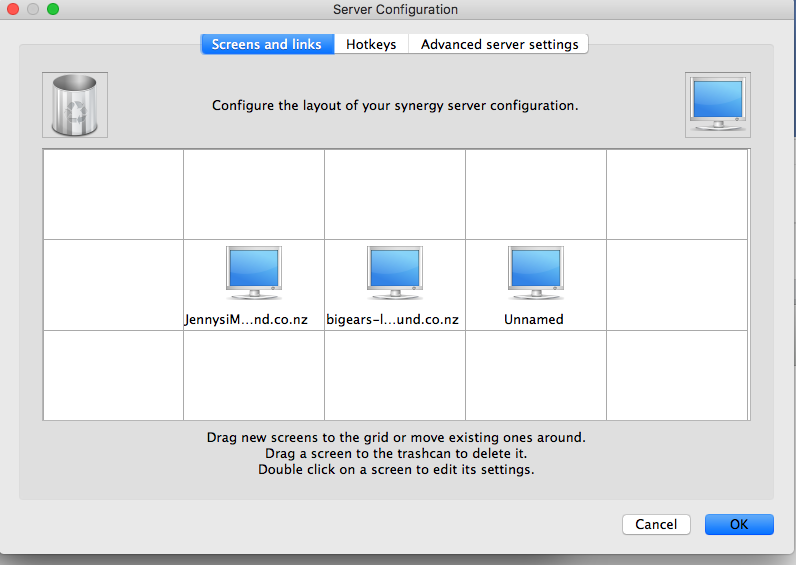 Started Synergy on the Macmini (old server/now client), the start up screen showed the server ok, but asked me to indicate itself in the Configuration window. When I opened the Config window it showed 2 screens as the Macmini. They are both attached to the Macmini, but I don't think they are both supposed to have the same name, so I deleted one and added a new screen, the external display, in its place. I decided to keep the old server as the new server, so Quit Synergy on both and started again that way. Both machines saw the other and displayed the correct screen configuration in the coloured window. It didn't quite start up but it's an improvement. I looked for the Synergy .plist file on that machine but couldn't find it in either Shared or User Library. Sorry I don't know the right names for the windows. Sometimes the Synergy GUI shows duplicate computer images, especially when a machine's name was changed. If so, you can just mouse-grab it and slide it out of the way and Synergy will ignore it as long as it's not touching another displayed screen. I assume with MAC it is the same. Great troubleshooting and documentation, Jenny. This will definitely help others in this situation! Um...does putting the duplicate in the trash can count as "moving it aside"? I suppose, since a copy remained, it was ok...I hope. I am very keen to get Synergy running now, as I have been trialling VEPro, which uses ethernet to run midi in and audio out of an audio slave computer...my Synergy server, as it happens, which taxes my mind further. And I have 2 days of free VEPro trial left, have learned a lot but not heard the result yet, and for reasons of minimal space have had to use a bluetooth keyboard that can be linked to either computer at a time. And two mice. A great deal better than balancing a keyboard on my knee or the piano, but switchover has been laggy, ans sometimes I forget to switch, with the result that I have frequently been typing into the wrong machine. Which may be the cause of some of the nasty graphics bust-ups followed by complete freeze/ push-the-button restarts Ive been having. Which are scaring me because a few days after starting to use Synergy (over wifi, not ethrrnet at that stage), I had a really bad one of those crashes and the HD died in the imac. My husband replaced it with a lovely SSD and suggested I don't continue with this slave-computer extravaganza. I hope my extraneous typing was to blame, and if I get Synergy running...as it did beautifully for 3 days prior to the disc failure...I can complete my trial of VEPro. So any further advice about uninstalling 1.8 completely would be welcome. I'd say the HD failure had no more to do with your typing than your typing caused the last light bulb failure in your home. Hard drives just sometimes quit, just like lightbulbs. I haven't done anything further re Synergy, but I'm pleased to report that, reassured by your comments, and using the switchable bluetooth keyboard CAREFULLY, I was able to complete my testing of the trail VEPro software, which passed with flying colours. In the last step (the activation of HSSE VSTplugin, if any VEPro users are reading) - which is the same point at which I crashed last night - pink wavy lines started appearing on the screen. At these now familiar, signs of imminent crash, I was able to save, close, quit and shut down in the normal manner. And hopefully have nailed down the cause of that problem. I can reexamine and if necessary do without that plugin. So the urgency has passed, and in due course I am sure I will get Synergy running beautifully once again on my new configuration. Thanks for your help and support here...i am sure I'll need more of it! And yes, I try to document clearly where I can, becasuse I have been totally dependent on other people's posts on numerous forums over the years. Googling is the only way I've managed to learn and troubleshoot to get this far, and I really appreciate the info available, much of it in people's forum posts, sometimes created years ago. Especially valuable when one is using old equipment and software, and the current websites and customer service reps no longer provide the info. Found now on MacMini: User (hidden) Library/Preferences - two copies! of a file- named "com.http-symless-com.Synergy.plist", 1 copy perhaps had 1 character added or different. Shift-clicked to get both, and moved to Trash. Went to trash to copy their names to add here, and found only 1 in trash! Also found, on both computers: User (hidden) Library/Preferences/synergy.plist - have trashed this file on both computers. Using wired keyboard and mouse on iMac, and bluetooth keboard and mouse on MacMini for start-ups, registration and configuration. 3. went to my Synergy account page, copied the Serial # and pasted it in the dialogue. 4. I opted to "Configure now" or similar. Only the Minimac was visible. I moved it to centre, added External display to right and Client computer to left. Probably irrelevant but I added Alias names for both computers in Config window. Synergy started and looked for Client. 1. I went to User(hidden)Library/Prefs, found and trashed the (created yesterday) .plist file, com.http-symless-com.Synergy. This was the only Synergy file present in Prefs. [I suspect that the file synergy.plist deleted earlier from MacMini was for Version 2.0, which was my first Synergy installation but I mucked up the installation, uninstalled (obviously not completely!) and haven't tried since. It would have been erased from iMac with the replacement of the disc and new operating system]. 3. had to register it again, as above for the MacMini. 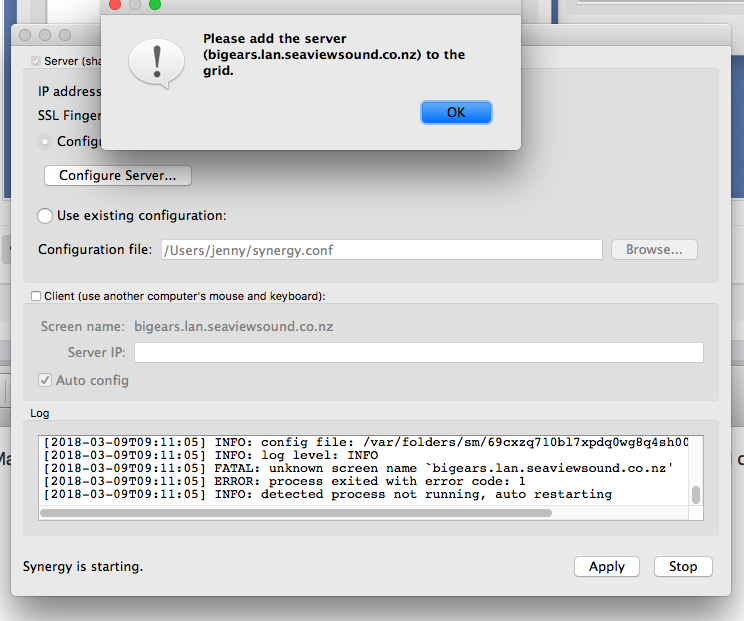 4. culled the mouse population by one wired, (leving 1 bluetooth mouse) and removed plugin keyboard from iMac where it had been required during all of the above, but once Synergy was in effect it caused conflict I think - the cursor got stuck in the middle of the Server window. Now - touch wood - all is well. Thanks again for the support. Funny how it gives one the courage to persevere even when it can't provide all the answers. 4. culled the mouse population by one wired, (leving 1 bluetooth mouse) and removed plugin [ie wired] keyboard from iMac where it had been required during all of the above, but once Synergy was in effect it caused conflict I think - the cursor got stuck in the middle of the Server window. 2nd mouse not the problem it seems in this situation. Exactly the same thing happened when I woke up both computers from a long sleep, waggling the BT mouse at them...the cursor appeared on the iMac which woke first, then there was a cursor also in the middle of the server screen, but I pushed my client cursor at the screen boundary for a couple of seconds, and as it moved to the server screen the useless cursor diappeared. Not a problem at all really.